In the early 1980s, Nintendo began releasing a series of handhelds. They were created by Gunpei Yokoi, who would go on to create the Game Boy. And now they are keychains! 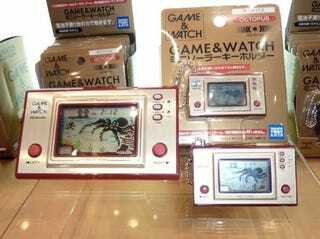 Japanese toymaker TakaraTomy is releasing solar powered Game & Watch keychains. Since they are keychains, they are smaller than actual Game & Watch. The sad thing? They are not playable (the screen is a dummy screen), but they have an alarm and a clock in them. The Game & Watch keychains will be out this March for about US$11.